Round-the-world (RTW) awards are one of the most lucrative and aspirational use of points and miles. Unfortunately, in recent years, many award programs, including all the major US airlines, have dropped their formal round-the-world redemption options. However, many global airlines continue to offer awards that are worth considering when your goal is to circumnavigate the globe. Today, as part of my 4-step guide to booking a round-the-world award, I’ll discuss the programs that still allow you to book a round-the-world awards. Where will you go on your round-the-world award? You end in the same country you start in, though not necessarily the same city. Despite these constraints, RTW awards can still offer extraordinary value with careful planning. Only Qantas offers a true round-the-world award ticket for redemption on Oneworld airlines (American Airlines, British Airways, Cathay Pacific, LATAM, Qatar, etc.). I recommend using the OneWorld Round-the-World Explorer tool to find routing options before searching for award availability. The Oneworld route network is uniquely strong in Asia, Oceania and South America. Qantas Frequent FlyerQantas is the only major Oneworld airline that continues to offer the option to book a true Round-the-World award using miles. Points from Starwood Preferred Guest (Mariott) and Citi ThankYou rewards can be transferred directly to Qantas at an even rate. Qantas is also among the most flexible programs. As you’ll learn, many of the requirements of other Round-the-World tickets don’t apply on Qantas. The sweet spot in this award chart is definitely business class. I recommend against the First Class award as only a few Oneworld airlines even offer consistent first class service (e.g. British Airways). You’ll end up paying the first-class rate even when only one or two flights are actually in First Class. Qantas is the only Round-the-World award option that is entirely distance based, meaning that you can fly in any direction you want as long as the total distance flown doesn’t exceed 35,000 miles. In other words, you aren’t required to actually fly around the world at all. An itinerary can include up to 5 stopovers and 16 individual flight segments. You must fly at least two Oneworld airlines that are not Qantas and there is no requirement to fly Qantas. Additionally, Qantas allows you to start building a reservation up to 12 months in advance of travel and then continue to add flight segments and make changes as award inventory changes. Every change to the reservation costs 5,000 Qantas points, but this additional flexibility is rare in the world of round-the-world tickets. Unfortunately, Qantas does pass along award fares (sometimes called fuel surcharges) on their own flights and partners, which means you’ll want to avoid high-fare partner carriers such as British Airways. Qantas Points can be hard to come by for those of us not already in Australia. However, Qantas does partner with Citi, allowing you to transfer ThankYou points at a 1:1 ratio. Ever since Delta Air Lines dropped its Round-the-World award in January 2015, Korean Air and AeroMexico are the only remaining partners that enable RTW awards using the SkyTeam alliance. Other notable SkyTeam airlines are Aeroflot, Air France, China Airlines, China Eastern, China Southern and KLM. The SkyTeam alliance is the smallest of the three global airline alliances, meaning your routing options may be limited, particularly in Latin America, Africa, and Oceania. 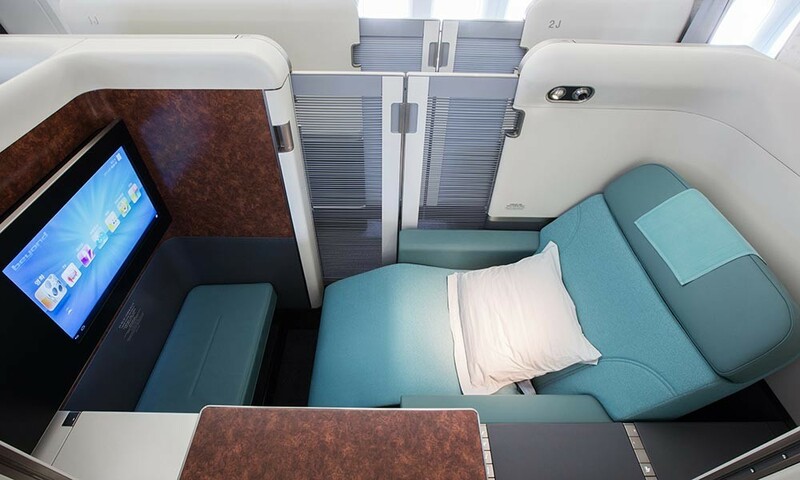 Korean Air SkyPass allows ound-the-World awards on SkyTeam partner airlines in economy and business, but not first class. Korean Air does charge award fares (fuel surcharges) on their own flights and certain partners, but they should be relatively reasonable. The awards cost 140,000 miles in economy class and 220,000 miles in business class. RTW itineraries can include three connecting flights, plus two additional connecting flights within each zone. You are allowed three stopovers, plus one additional stopover in each zone, allowing a total of six stopovers. Backtracking is allowed within a zone, but not between zones. Additionally, Korean Air won’t allow you to book awards on blackout dates of the corresponding SkyTeam airline. Korean SkyPass partners with Chase Ultimate Rewards, allowing you to transfer points at a 1:1 ratio. While these mileage requirements are higher than Korean Air, AeroMexico allows you to include up to 15 stopovers (maximum of five per continent). AeroMexico does charge fuel surcharges on their own flights and partners. AeroMexico partners with American Express, allowing you to convert Membership Rewards into Club Premiere kilometers at a 1:1 ratio. Star Alliance is the largest of the big three airline alliances and therefore is often easiest to use when booking Round-the-World trips. The Star Alliance round the world tool can be helpful for planning (or daydreaming!). A Lufthansa RTW award allows a maximum of seven stopovers and up to 10 flight segments. Awards must include at least 10 days between the departure of the first intercontinental flight and the departure of the last intercontinental flight. For example, if you leave the US on November 10 heading east, your return flight over the Pacific to the Americas (not necessarily the US), cannot depart any earlier than November 20. Lufthansa does add fuel surcharges on their own flights and many of their partners, which can add up quickly. Given these surcharges and the exorbitant mileage requirements, I generally do not recommend Lufthansa for award tickets unless you already have a large mileage balance with the program. Lufthansa Miles & More can be hard to accumulate. The best option is to transfer SPG/Marriott points at a one-to-one ratio to the program. You’ll earn 5,000 bonus miles for every 20,000 miles transferred. Unfortunately, these lower mileage rates come with more restrictive conditions. Aeroplan allows a maximum of five stopovers and one open jaw. You’re only allowed one stopover in any one city and your return flight cannot go past the point of origin. So, for instance, if your travel starts in Los Angeles and you travel east, your return flight cannot terminate in New York City. Aeroplan does add fuel surcharges on many partner flights, but these charges can be minimized with careful planning. Aeroplan partners with American Express, allowing you to instantly convert Membership Rewards into Aeroplan miles at a 1:1 ratio. Singapore offers one of the better round-the-world options for Star Alliance. Plus, booking with Singapore may allow access to exclusive premium award inventory on Singapore-operated flights. Singapore often only releases Suites (First Class) seats to KrisFlyer members. Up to seven stopovers are allowed on a Singapore RTW award. Singapore does not charge fuel surcharges on their own flights but does collect for certain partners. Again, these surcharges can be minimized by avoiding specific partners. Singapore’s KrisFlyer is one of the few programs that partners with all four major transferable points programs. That means you can consolidate points from multiple programs to meet the minimum mileage requirements for a round-the-world award. You can transfer points to Singapore’s KrisFlyer from American Express Membership Rewards, Chase Ultimate Rewards, Citi ThankYou Rewards, and Starwood Preferred Guest. ANA’s Mileage Club offers one of the best value round-the-world award options. It’s also one of the most complex. ANA mileage requirements vary based on distance flown and class of service. The award chart below details the requirements (ANA watchers will recognize this chart as the original ANA award chart before the 2015 devaluation). ANA allows up eight stopovers on their awards with 12 flight segments. ANA does pass along fuel surcharges on some of their partners. My next post details how to book a RTW with ANA.